Lately I've been obsessed with Essie On A Silver Platter. I actually picked this up last year and posted about it. Funny enough, OASP was my last post of 2013, and now it will also be in my last post of 2014! 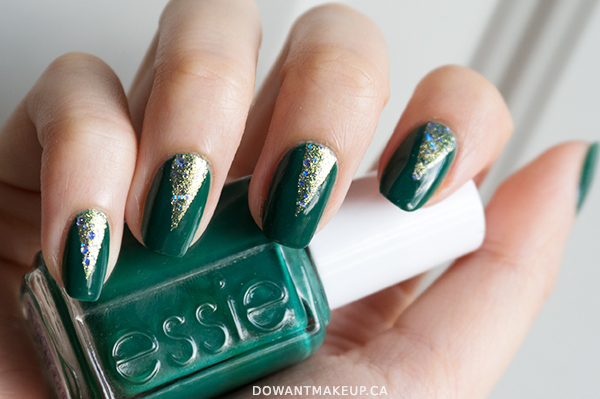 Totally unintentional, but it was just recently that I realized what a stunner it is in nail art! I expected the glitter gold base to be a bit sheer/sparse, but it appears gloriously here on top of Essie Going Incognito. 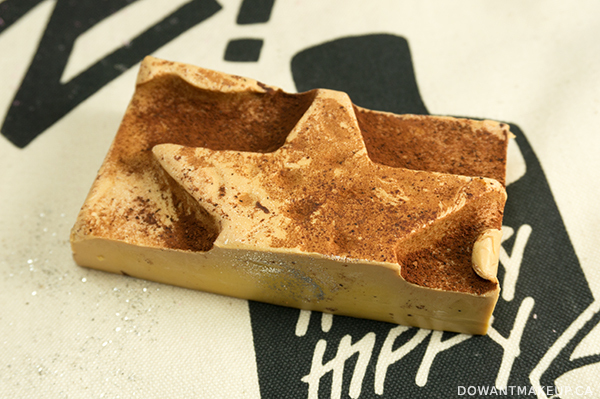 This is such an easy way to add a little bit of glitter if you don't want to go full-on sparkle. 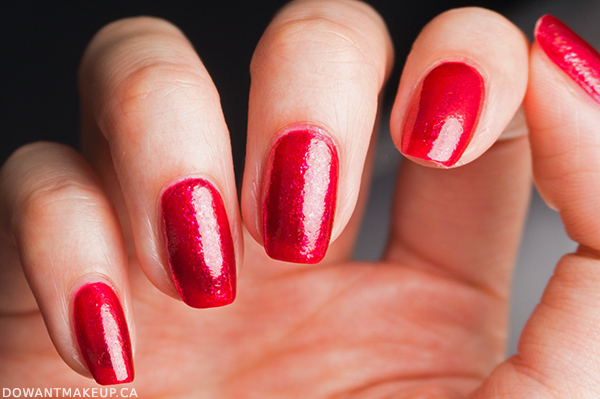 Paint 2-3 coats of your creme polish of choice, then allow it to fully dry. You can test if it's ready by gently pressing on your nail with a finger--if it leaves even the slightest fingerprint, you should wait a little longer. Tape off triangles using washi tape or regular office tape (for regular tape, I always weaken the adhesive by gently sticking it to the back of my hand first.) 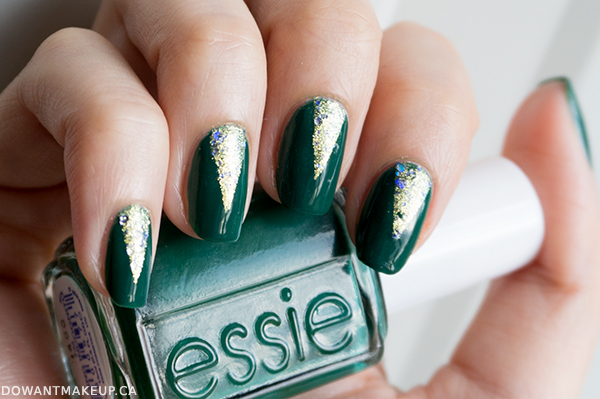 Make sure there are no gaps between the tape and your nail surface, then layer on a coat of your glitter polish and remove tape immediately. 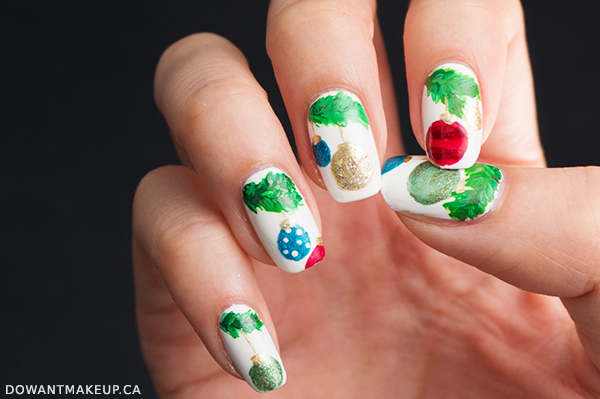 I had the idea for ornament nail art brewing in my head for a while. I thought those paper hole reinforcements would be just the thing to get perfect circles, but it was a pain to work with! They refused to lay flat on my nail, leaving small pockets for polish to leak through. It was a bit better when I cut them in half and arranged them to form a circle, but honestly it ended up being way easier to freehand the ornaments, even though they're not perfect. 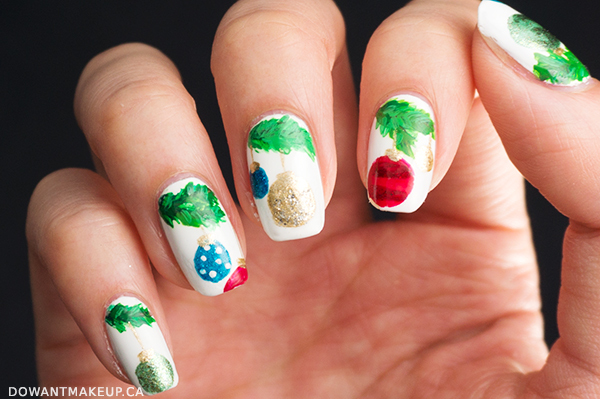 For the ornaments, I used Orly Luxe, Zoya Rikki, Zoya Liberty, ELF Smokin Hot, and China Glaze Ruby Pumps. I used OPI Alpine Snow as the base and also to add polka dots to the blue ornament, and Orly Luxe to draw the strings and caps. Although it's hard to see it, ELF Smoky Brown makes the branches, plus acrylic paints for the pine needles. We haven't had a Christmas tree in my house for the past few years, but somehow looking at these nails makes me all warm and fuzzy inside. Decorating the tree used to be one of my favourite things about Christmas until I got older/lazier/lost my sense of childhood wonder. Hmmmm maybe next year I'll haul out the decorations and actually put up a tree. I have a huge backlog of nail posts to edit and write, but I just couldn't resist letting Nicole by OPI I Love You Cherry Much jump the queue. I used it on a whim last weekend and was struck by what a gorgeous and perfectly holiday-appropriate polish it is. 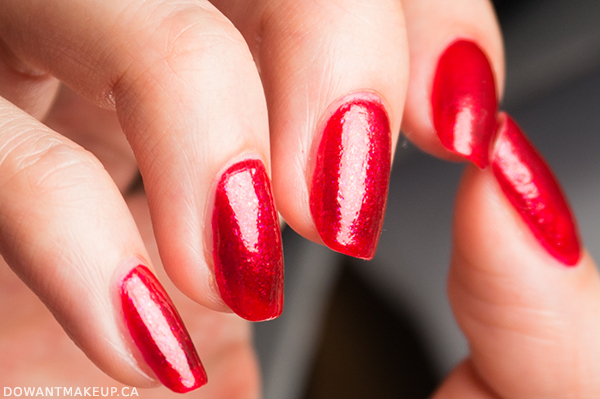 This is a bright cherry red packed with flakies that provide sparkle and dimension. 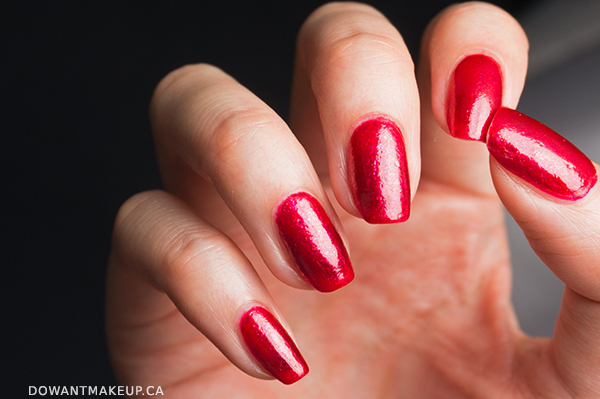 Because the sparkle factor comes from flakies and not glitter, it's a little different and special from most red holiday polishes. It positively glows. I kept looking at my nails and thinking, "yep, this is the polish Mrs. Claus probably rocks year-round" lol. One drawback is that it is pretty sheer. I've swatched it here with four coats, and I still get a slightly visible nail line, plus you can see a hint of the blue staining from Zoya Liberty underneath. The formula is also slightly thinner than I'm used to, so it flooded my cuticles, which was sucky super fun to clean up. But with four coats, you get quite a build up of flakies, resulting in a pretty, almost-foil look. My family doesn't really celebrate Christmas, but something about this polish makes me want to decorate a Christmas tree or something! How are your holidays going? 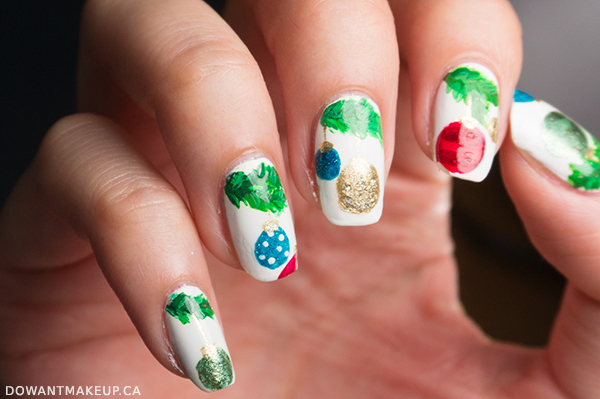 What are you wearing on your tips right now? Hello! Just a quick nail post today as this week has been so hectic for me! I bought Zoya Liberty PixieDust from Ulta some time ago but it was only recently that I properly swatched and photographed it. 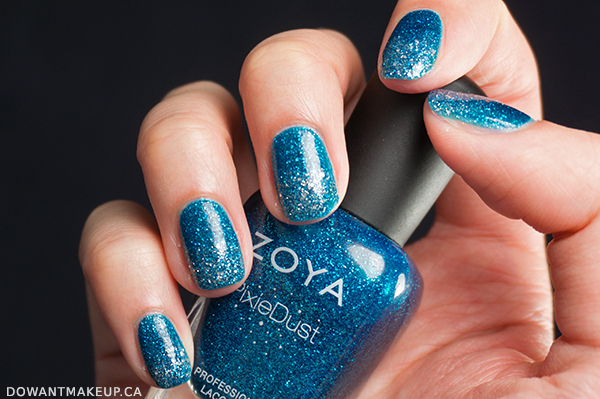 Zoya PixieDusts are a special line of super-glittery polishes. 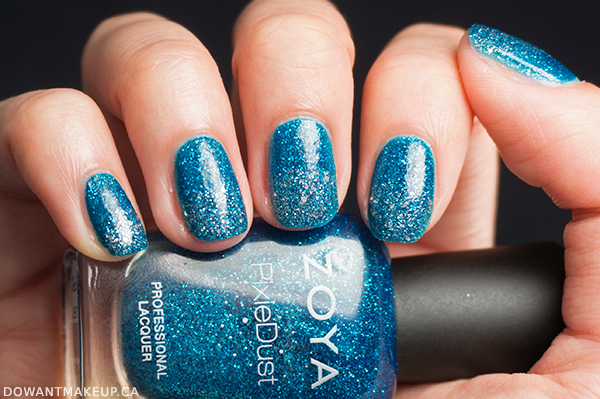 Liberty is a bright, saturated blue, and it feels like the glitter enhances the brightness even more. It's matte when dry with a textured, sort of sugar-crusted look, but I prefer it with a shiny top coat hands-down because just look at the glitteriness. LOOK AT IT. I also added a bit of silver glittery topper from Layla Pro at the tips because obviously there wasn't enough glitter yet. Hey Friends! I'm Amanda from Ginger Chic. This month I had the honor to write a guest post for the lovely Angela through the CBB Network. This month's theme is The Best of 2014. First of all, let me just say what everyone is going to say... it is INSANE that 2014 is almost over! 2014 was the year that I really branched out in the makeup department and started trying a bunch of new colors and products. Especially lipsticks. My lipstick collection grew this year by like 400% from the year before. My bank account is crying about it, but I'm not complaining! So naturally I decided to dedicate this post to the Best Lipsticks of 2014. 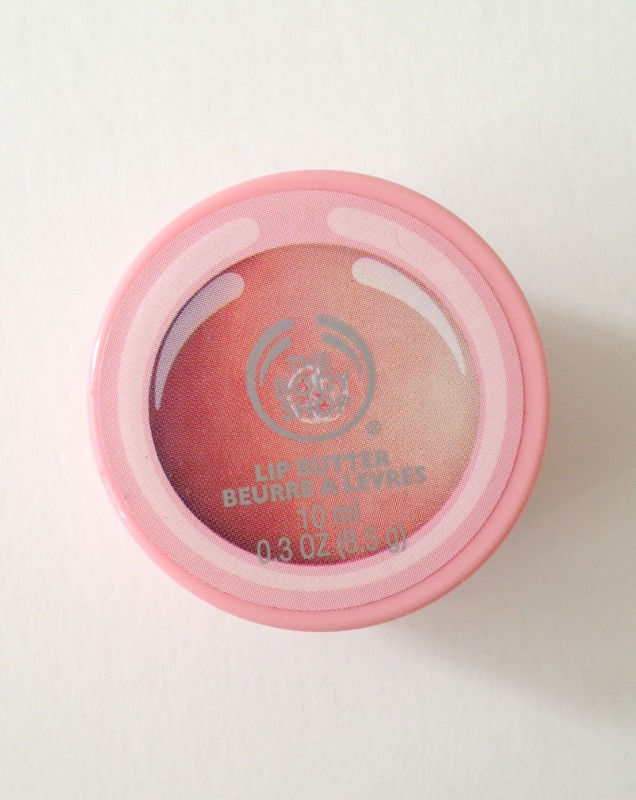 I love all things from The Body Shop and I have been obsessed with these lip butters all year long. They are super moisturizing without being goopy and gross. 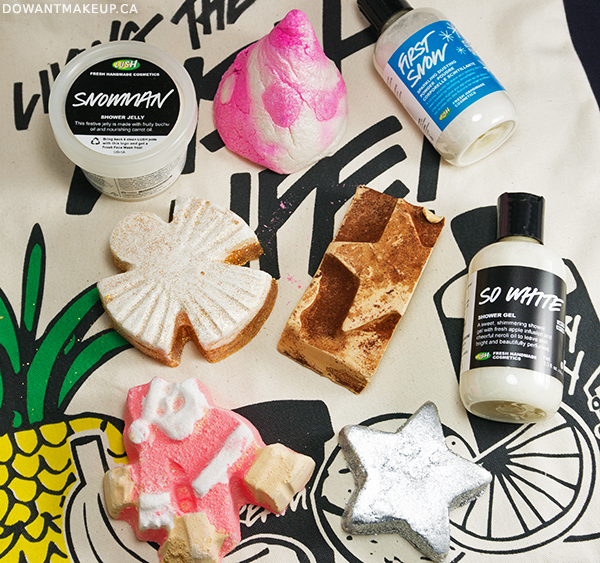 The one I am currently using is the Grapefruit one and it is my all time fav! They are the perfect balm to wear underneath of matte lipsticks. Cold winter weather + wind + dry, indoor heating can really be harsh on even skin that is pretty normal most of the time. For me, I definitely notice that my skin gets even drier and more sensitive in the winter. That's why I think Nivea picked the perfect time to introduce their new Sensitive line! I received samples of the Sensitive Day Care and Sensitive Night Care moisturizers and have been testing them out over the past few weeks. These moisturizers are designed to reduce the tightness, redness, and dryness of parched skin. 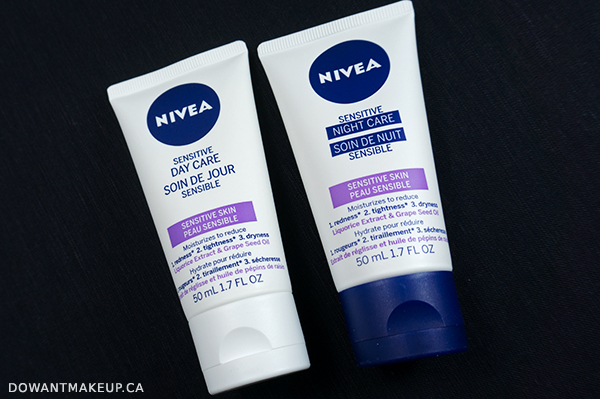 The headliner ingredients here are licorice extract and grape seed oil, which Nivea says helps reduce the redness brought on by dry skin. 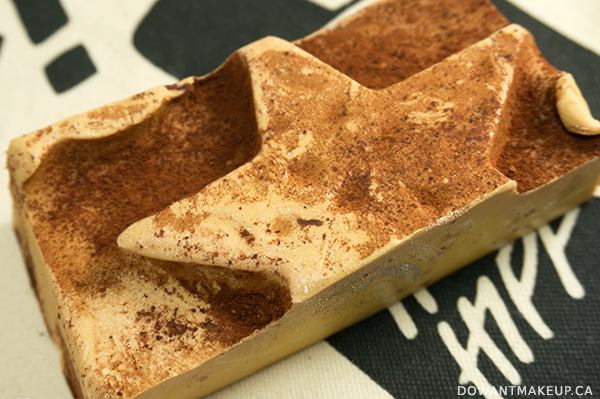 (Apparently licorice root extract may also inhibit an enzyme that is key in hyperpigmentation. Neat!) They also have a few other ingredients I personally like to see in my skin care products: glycerin (a humectant), panthenol (moisturizing), and shea butter (Night Care only). They are formulated without added fragrance, colour, or parabens, which is great news as many people can be sensitive to these ingredients. Both come with a convenient flip-top cap in 50ml tubes. The size is a bit smaller than I am used to for a face moisturizer, but on the other hand it's perfect for travel. 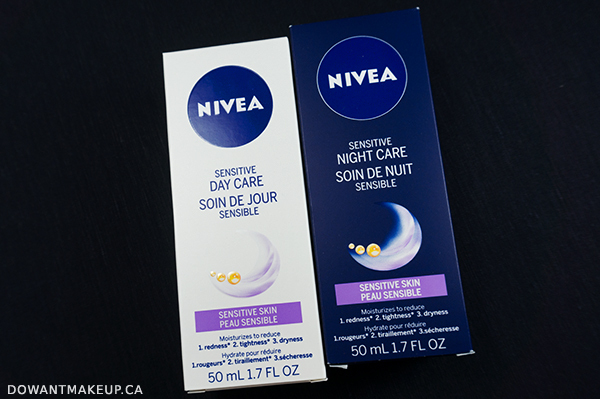 The packaging is identical except that the Night Care moisturizer cap is dark blue. This is probably my third or fourth time swatching and photographing butter London Lady Muck. The photos turn out badly or I'm not happy with the application, blah blah. I finally snapped some photos that look okay, so here we are. This was a gift from a sweet friend who gave me 3 butter London polishes off my wishlist one Christmas. 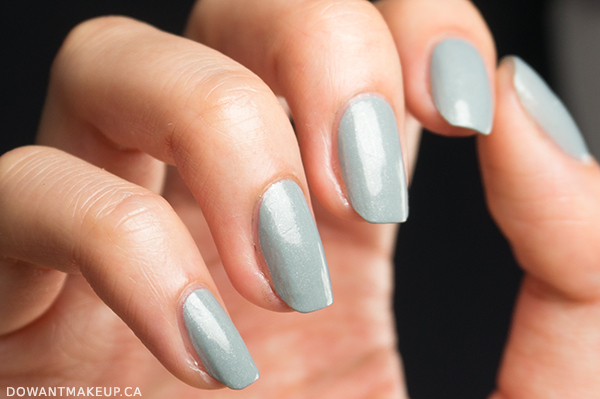 Lady Muck is a soft blue-grey with a slight pearly finish and a superfine silver shimmer. The colour reminds me of the sky over the ocean on an overcast day. It is very similar to China Glaze Sea Spray, but deeper and with the silver shimmer. I have seen swatch photos where Lady Muck looks like it has a much brighter blue base, but for me this is a very subdued, muted blue. Lady Muck is apparently British slang for an arrogant woman or a woman that has "pretensions of a high station" yet is anything but (thanks, Urban Dictionary!) This is actually a rather fitting name, but not in a good way. Because my other butter Londons have been so amazing formula- and colour-wise, I expected the same from Lady Muck. Unfortunately, the formula on this one is kinda unforgiving: thin, doesn't level itself well, and can show brush strokes readily (possibly because of the pearly finish.) So it has a fancy, pretty butter London bottle but the formula is hardly what I expect from butter London. It's pretty but not one I reach for often because the application requires more effort/patience than usual. Ahhh I love how the twirling skirts become flowers at the end. 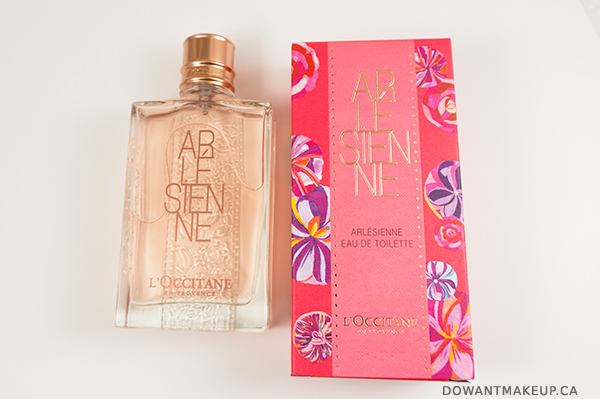 The overall mood of the clip--feminine, mysterious, a bit festive--is a great way to describe this fragrance. Let's just pretend everything here is in focus, okay? Sephora Natural Vitamin C + E Blotting Papers - These thin tissue blotting papers were basically everything I am looking for in a blotting paper: powderless, tissue is not too thick, and one sheet is large enough to blot my dry/sensitive skin without going back for a second sheet. Sephora has discontinued these, but I've found a perfectly good replacement in the Sephora Herbal Rose Blotting Papers. LUSH Celestial Facial Moisturizer - I think this one is #3? LUSH Celestial is an absolutely essential product for me because it is basically 99% responsible for managing the eczema around my mouth. I keep one at home, one at bf's place, and also a little bit in a sample container for my purse. Marcelle Oil-Free Eye Make-up Remover Pads - I got this as a GWP with some other Marcelle makeup removing product and was pleasantly surprised! The pads are not scratchy and do a good job of taking off whatever eye makeup my cleanser has missed (FYI I don't usually wear heavy eye makeup though.) I kept this jar at bf's place since it's easier and takes up less space than a remover and facial cottons. I liked the effectiveness and convenience enough that I ordered another one during Marcelle's 40% Cyber Monday sale. 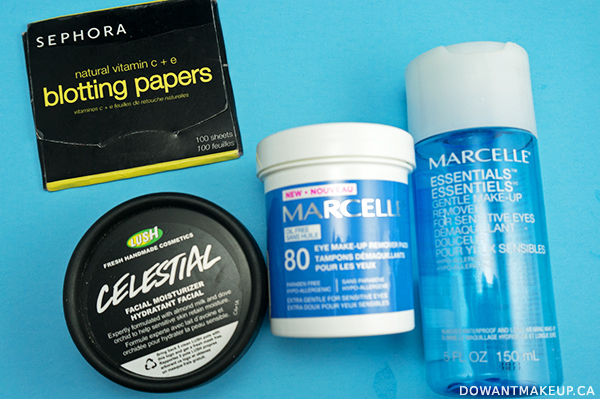 Marcelle Essentials Gentle Make-up Remover For Sensitive Eyes - I love this stuff. This is a bi-phase makeup remover, meaning the oily ingredients tend to separate from the watery stuff (much science explanation, I know) so it needs a good shake before pouring out into a cotton pad. Remember my love letter to Marcelle Soothing Cleansing Water? This is the stuff I use to take off waterproof makeup, which Cleansing Water (now called Micellar Water) sometimes struggles with. Makeup comes off in a flash and it never stings my eyes.